Spiegel & Grau, 9780399181160, 288pp. 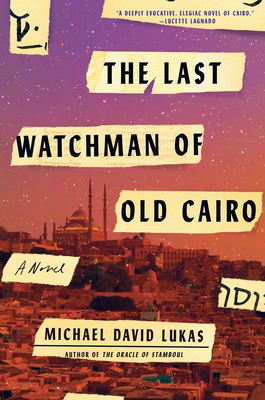 In this “wonderfully rich” (San Francisco Chronicle) novel, a young man journeys from California to Cairo to unravel centuries-old family secrets. Joseph, a literature student at Berkeley, is the son of a Jewish mother and a Muslim father. One day, a mysterious package arrives on his doorstep, pulling him into a mesmerizing adventure to uncover the tangled history that binds the two sides of his family. For generations, the men of the al-Raqb family have served as watchmen of the storied Ibn Ezra Synagogue in Old Cairo, built at the site where the infant Moses was taken from the Nile. Joseph learns of his ancestor Ali, a Muslim orphan who nearly a thousand years earlier was entrusted as the first watchman of the synagogue and became enchanted by its legendary—perhaps magical—Ezra Scroll. The story of Joseph’s family is entwined with that of the British twin sisters Agnes and Margaret, who in 1897 depart their hallowed Cambridge halls on a mission to rescue sacred texts that have begun to disappear from the synagogue. Michael David Lukas is the author of the internationally bestselling novel The Oracle of Stamboul, which was a finalist for the California Book Award, the Northern California Independent Booksellers Association Book of the Year Award, and the Harold U. Ribalow Prize and has been published in fifteen languages. He has been a Fulbright Scholar in Turkey, a student at the American University of Cairo, and a night-shift proofreader in Tel Aviv. A graduate of Brown University, he has received a fellowship from the National Endowment for the Arts, and his writing has appeared in The New York Times and The Wall Street Journal. He works at the Center for Middle Eastern Studies at UC Berkeley and lives in Oakland, California.